Hi, Would You Like to Try Some Pears and Cheese? That’s right ladies and gents, today I was selling pears. I imagine you made a random guess at that when I started talking about work, given the title of this post and you being a clever person anyway. I imagine anyway! 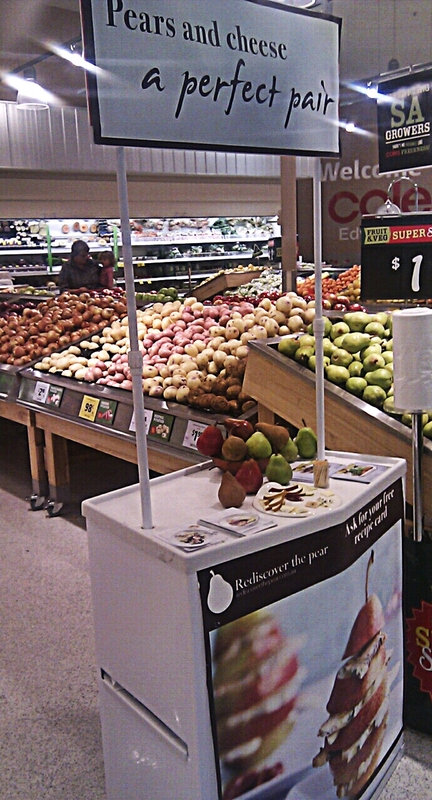 Anyway, today I was selling Australian grown pears; specifically the William pears, Red Sensations and Bosc pears. Out of the three I liked the Bosc best, but the Red Sensations were pretty delicious too. To expand on what I actually do, basically each time I get shifts for a new campaign I read the brief which is very specific on what I wear, where I stand, what I say, etc etc. I collect my posters and other bits and pieces (in this case recipe cards, but can range from competition fliers to a pizza oven) every fortnight. I go do my shift which usually involves me counting all the stock of what I am selling before and after my shift. I manually counted counted boxes and boxes of lollies and chips for about three months before I realised they can scan the barcode and tell me how many are in stock… urgh. After my shift I have to do my reporting. Basically I try and figure out roughly how many people I spoke to, difference in stock before and after shift (it is absolute shite when they get their new stock right in the middle of my four hours), if there were other demonstrators in store, if yes then who do they work for and what were they doing, feedback about the product, if they would be buying in future, etc etc. Today went really well, partly because it is a good product that 99% of the population isn’t adverse to and also because we never really forget the skills learnt during the poor young adult stage of our lives, and free food is free food. That is reason enough! The kids loved it too, and I introduced some of them to brie, camembert and blue cheese, who actually really liked it. In total over 100 people who tried my offerings went on to buy pears, yay for me! I made a sale on my third customer and I was so proud of myself, haha. I still feel slightly awkward sometimes, but I’m better at just talking now. You kind of have to be when trying to sell air freshener, or paper towel, or bathroom wipes, or bread, or coffee, or yoghurt. I have done all these, with varying success. I’m still hired though, so can’t be doing too badly! Also get to do some promo stuff for Telstra, which is always a lot of fun! My favourite successes were when I went through 30 blocks of chocolate cut into small sample sized pieces in 2.5 hours, and sold 40 blocks too; and also when I sold 90 punnets of blueberries in four hours. Reasons I love my job: I usually know when my shifts are going to start AND when they are going to end (unlike hospitality). I usually know when my shifts are going to be each week. My shifts are flexible and can be re-arranged fairly easily. I am not under constant scrutiny from my boss, and I don’t say that because I am a poor worker, I just feel more self-directed. I am always in a different shop selling a different product (I tend to get bored easily if I’m at the same establishment for too long). Anyway, I’m exhausted and have Italian and work again tomorrow. G’night blogosphere, dream pretty dreams. This entry was posted on March 22, 2012 by Kodiko in Life and tagged blue cheese, bosc, brie, camambert, cheese, demonstrator, fruit, i love my job, pears, promotional, red sensation, sales, sweet treats, william, work.